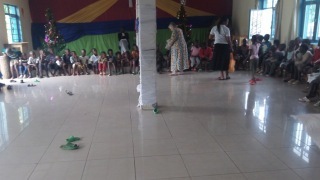 Sharing Christmas with the kids from the neighborhood was awesome. I had the usual qualms. What if nobody comes? I need not have worried. 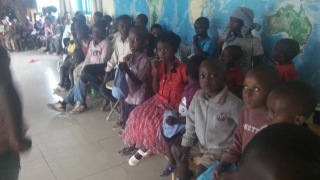 Over 150 kids from the very youngest up to secondary school age arrived. The little ones learned to play HOT POTATO & DROP THE HANDKERCHIEF and the big kids played football, basketball and volley ball. Cookies and juice were served, lolly pops and a small gift was given to every child under 12. A chocolate was given to the older kids after cookies and juice. Chocolate is a special treat here. From the youngest to the oldest all had a good time.